In 1967, the Beatles were perhaps the most well-known band in the world. Ever since their debut album, Please Please Me, they became instant stars, well-known because of their rockabilly music, their suits and of course, the now iconic, “beatle” boots. They toured the world between 1963 and 1967, yet they grew tired of the touring and eventually decided to focus on their studio material. This is where the idea of the 1967 LP Sgt. Pepper’s Lonely Hearts Club Band came from. They weren’t taken very seriously as musicians and they always felt constricted due to their “boy band” image. However, Sgt. Pepper was named the No. 1 album of all time, and for good reason. And now, 50 years later, Sgt. Pepper is as fresh as ever. The author in his Sgt. 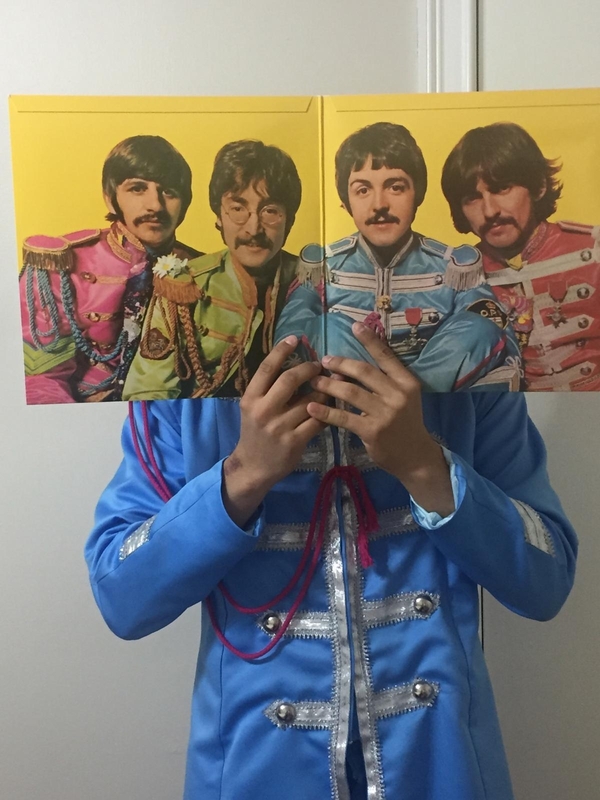 Pepper suit displaying the iconic gate-fold of the record. The Beatles completely re-invented themselves through this LP. Although they dabbled in experimental music in their 1966 LP Revolver, Sgt. Pepper was a complete leap forward in terms of songwriting and creativity. Highlights of the record include “Lucy in the Sky with Diamonds,” where John Lennon takes listeners down a psychedelic river filled with colors and adventures; “Within You Without You,” where George Harrison shows you the ways of spirituality and life and “A Day in the Life,” the iconic closer to perhaps the most influential album of all time. Sgt. Pepper changed the game for music when it was released. This was a big step forward for the band because they focused on creating a whole album that flowed together like a story, not just a collection of songs like their previous LP’s. Many consider Sgt. Pepper to be the first concept album because the Beatles wanted to escape their clean-cut image and they wanted to be recognized as real songwriters. From the gate-fold to the front and back covers, the whole album was meticulously catered to what the Beatles wanted. Being the biggest band in the world back in those days, they took an enormous risk by putting this album out. Having a fan base of mostly teenage girls, they might have not liked what direction the Beatles were heading in. But, Sgt. Pepper was instantly recognized as a classic upon release. It boasts some of the most well-known Beatles songs, such as the title track,”Getting Better” and “With a Little Help from my Friends.” Sgt. Pepper was experimental and testing the boundaries of popular music in 1967, and it set the bar very high for not just the band, but the entire music industry. Today, 50 years after the release of the record, we still see the legacy that the Beatles left back in 1967 with Sgt. Pepper. The album has and will continue to influence musicians and artists for many more years, much longer than any Beatle or original Beatle fan will ever see. The Beatles engraved themselves into history and Sgt. Pepper is just one of their magnum opuses.